Both my father and Edgar are grandchildren of Marley and Frank, or children of Marley’s children. My father is the son of Marley & Frank’s son, and Edgar is the son of Marley & Frank’s daughter. Approximately 25% of my father’s DNA comes from Marley, and approximately 25% of Edgar’s DNA comes from Marley. Although it is not the same 25% in both cousins (because the children inherited random pieces of Marley’s DNA and then passed on random pieces of that DNA to their children), it is statistically nearly certain that they will share some of Marley’s DNA. Indeed, first cousins are predicted to share 12.5% of their DNA, with about half each from the shared grandparents (6.25% of their shared DNA from Marley, and 6.25% of their shared DNA from Frank). Both will have much more DNA from these ancestors, but it won’t be shared between them. By comparing the autosomal DNA testing results of my father with Edgar, it will be possible to identify the DNA that they have in common. Because they only share Marley and her husband Frank as ancestors (an important assumption here), then any DNA they have in common must be DNA that they inherited from Frank and Marley. Of course, this is dependent upon Edgar and me not sharing any DNA from other ancestors, for example on my maternal side. If we shared other ancestors, it would be much more difficult (but not impossible) to identify which DNA came from which ancestors. However, given Edgar’s paternal ancestry – the side which does not involve Frank and Marley – this is exceedingly unlikely (but will be kept in mind during future analysis). I now have autosomal DNA results for Edgar and myself using Family Tree DNA’s Family Finder, and more specifically using their new Illumina OmniExpress chip. The figure below highlights the regions of our genomes where we share at least 3cM stretches of DNA. Note that I’ve used my DNA for this test, rather than my father, simply because have yet to test my father. The numbers change slightly, as I’m predicted to share 6.25% of my DNA with Edgar, my first cousin once removed. We share about 333 cMs (268 million base pairs), which I’ve calculated to be about 4.4% of our genomes (please chime in if you think this estimate is incorrect, as I haven’t had sufficient time to explore it). With this map and the data that comes from it, I’ve identified portions of my genome (and Edgar’s) that come from Marley and Frank. Although I don’t know which portions came from who, I have a wealth of information I can now use to explore our shared ancestry. So now what? Now, I wait for matches shared by Edgar and I, people who share one or more of these stretches of DNA. Currently, we do not share any individuals. If another individual shares a piece of the identified DNA, it is likely that they are related through Frank and Marley. As I have a great deal of information about Frank’s ancestry, I can try to narrow down the matches to Marley’s ancestry. This, of course, presents one of the biggest challenges of this approach. Further, identifying relatives is only the very first – and the easiest – step. Once I have identified someone who might be Marley’s biological relative, I have to obtain as much of their genealogical tree as they are willing to share in order to mine it for information. 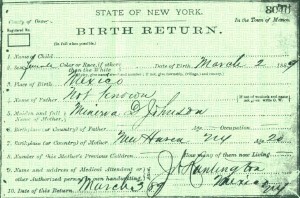 I will be looking for families that lived in or migrated through the Upstate New York area in the early 1880’s. Of course, I must consider all the descendants of any potential relatives as well. Yes, it’s a great deal of work, and there is no guarantee that I will ever identify a link. For example, what if John Doe, Marley’s father, took an undocumented vacation in Upstate New York to visit his best friend and had a fling with Marley’s mother? I may not be able to uncover that connection either in paper records or in DNA, at least for now. My best bet is to accumulate as much information as possible – paper records, DNA, gedcoms, family trees, etc. – and slowly create a web of paper and DNA. This web will undoubtedly slowly reveal overlapping information that hints at Marley’s ancestry. For example, there may only be one potential male individual who possesses DNA from family X, DNA from family Y, and DNA from family Z, all of which Marley inherited and of which Edgar and I share. A needle in a haystack, but an exciting possibility nonetheless. In the future, I can attempt to mine existing genomes for more data. For example, by comparing my father’s siblings with Edgar’s DNA. Statistically, they will share different portions of their genome with Edgar, allowing me to more completely identify the DNA in Edgar’s genome that came from Frank and Marley. Since Edgar is the extent of the other line, and Marley’s children are dead, this is the best I can currently do (until I can sequence Marley’s DNA directly from the stamps and letters she licked and I’ve saved). Essentially, using autosomal DNA testing and the approach described above, I have re-created portions of my great-grandparent’s genomes by identifying bits and pieces of their DNA in living individuals. What an exciting time to be a genealogist. Now let me know, do you have any tips or suggestions for me as I continue my hunt for Marley’s parents? If so, please share them below. I am also soon planning on getting a couple of my first cousins 1x removed tested. Thanks for showing the comparison. I think you are right about the 4.4%. Have you listed this data on Gedmatch.com? How can one find the start and end locations for these stretches of chromosomes? 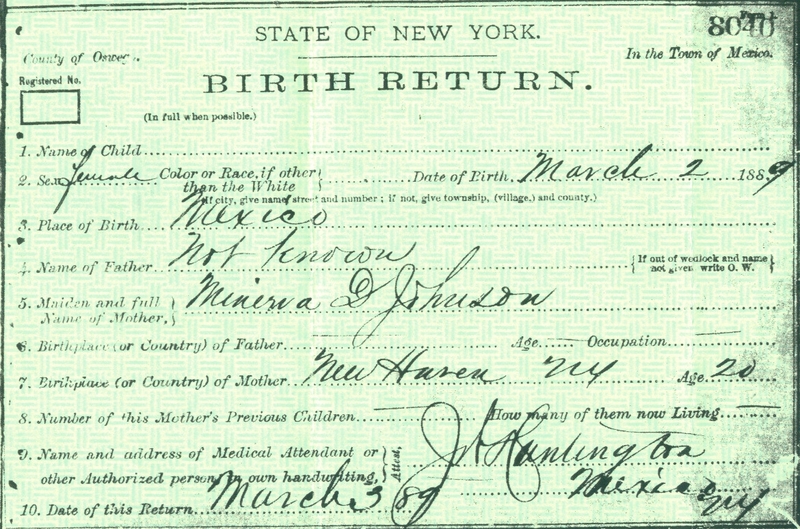 Just curious, since I had JOHNSON relatives in Oswego, NY about that time (1890). In spite of the JOHNSON name, they had been of Irish origin. 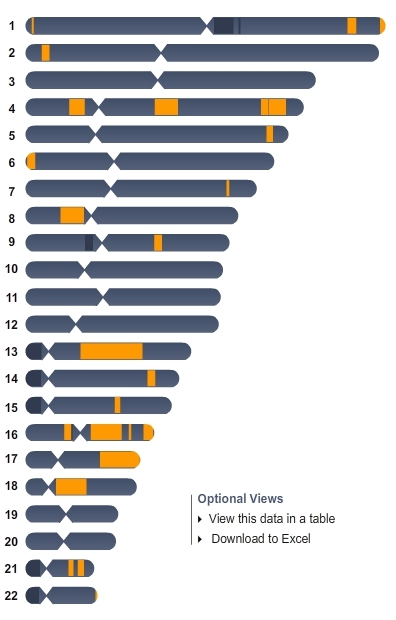 It still might be of interest to compare my 23andMe V3 results. This is the same approach I’ve been using to identify my father’s Jewish ancestry and distinguish his paternal and maternal lines. He and a 2nd cousin once removed share just over 1% of their genome. Even that small amount of shared DNA has yielded amazingly useful analysis. Andrea – thank you for sharing the photo; while writing this post, I was trying to find similar pictures of first cousins or first cousins 1X and shared DNA. Neither my father nor I could share an X chromosome with our cousin, but my aunts just might (a lengthy story for another blog post!). I’m hoping to pursue that in the future. Thomas – I do indeed have this data on Gedmatch.com, hoping to find relatives that I and my cousin 1X share in common, but have had little success so far. Perhaps it might be worth a comparison! Susan – just over 1% is dead-on with the predicted amount of sharing! So glad to hear that this shared DNA has yielded results. Have you written about your research at all? I’d be interested in reading more about it. Thanks for this info and insight. Nice reading ! Fascinating stuff. 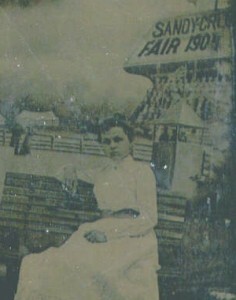 One of my gt-gt-grandmothers born in Lancashire in 1854 has uncertain origins but a clear line of (male) descendants. This has given me food for thought and I will be looking out for updates on your search. I have a very similar situation with my gg-grandmother, born in England around 1842 to unknown parents, although there is a family legend which surrounds her birth and parentage. Her last surviving grand-daughter has been tested, and I’m slowly feeling my way around the next steps. It’s an expensive business so I can’t afford to get tests left, right and centre. Your suggestion to get tests for two separate descendants who share the adopted person’s DNA is an interesting one. I wondering whether I should try this too, or save my money for a descendant of a separate, potentially linked line should I find one. The suggestion to accumulate as much information as possible, documentary and DNA, is good. There’s so much data to sift through among the potential, although distant, matches, that it’s a little daunting.